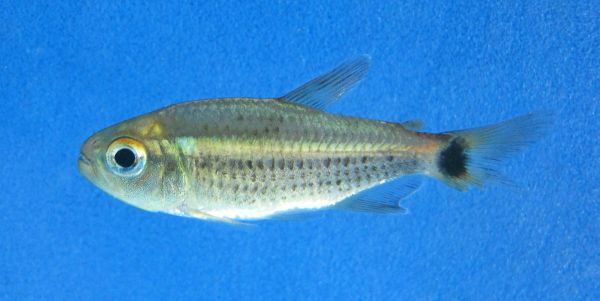 The genus Moenkhausia is among the most diverse within the family Characidae, with almost 80 species included at present, although it is in need of extensive taxonomic revision. Recent phylogenetic analyses have revealed the to represent a polyphyletic assemblage, with at least five distinct lineages recognised, some of which also contain members of other incertae sedis genera such as Hemigrammus or Hasemania. One of these putative groups is referred to as the Moenkhausia oligolepis/M. sanctaefilomenae complex, and includes species sharing a reticulated colour pattern formed by dark posterior scale borders on the body, a vertically-elongate humeral blotch, a dark caudal peduncle blotch preceded by a lighter area, and often a red eye. Currently included are M. cosmops, M. cotinho, M. diktyota, M. forestii, M. oligolepis, M. pyrophthalma and M. sanctaefilomenae, among which the latter is a popular aquarium fish commonly referred to as ‘red eye tetra’. New species M. lineomaculata Dagosta, Marinho, & Benine 2015 is the latest addition to the group, and can be distinguished from all other members, except M. cotinho, by the presence (vs. absence) of longitudinal rows of dark spots on the body. It differs from M. cotinho by possessing an evenly-pigmented (vs. darker dorsally) humeral blotch, and a thin dark midlateral stripe originating beneath the dorsal-fin insertion (vs. originating posterior to the humeral blotch). The number of pored lateral line scales is variable, a rare trait in characids but present in some other members of the Moenkhausia oligolepis/M. sanctaefilomenae complex. 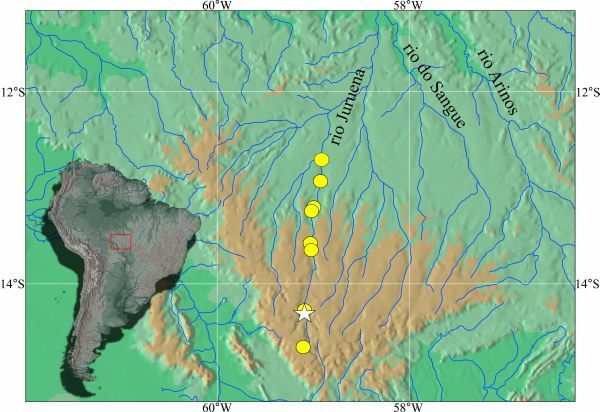 M. lineomaculata is known only from the rio Juruena watershed within the upper rio Tapajós basin, Mato Grosso State, Brazil, where it occurs sympatrically with M. cotinho. For additional information see the full paper (link to abstract only): Dagosta, F. C. P., M. M. F. Marinho, and R. C. Benine, 2015. A new species of Moenkhausia Eigenmann (Characiformes: Characidae) from the upper rio Juruena basin, Central Brazil. Zootaxa 4032(4): 417-425. Thanks to Fernando C. P. Dagosta.